He-Man and the Masters of the Universe is a six-issue DC miniseries published in 2012 and 2013. It was written by Keith Giffen and James Robinson and illustrated by Philip Tan, Ruy Jose, Pop Mhan, and a number of others. Here, Skeletor has conquered Castle Grayskull and erased the memories of all the Heroic Warriors. I appreciate that the writers are trying to do something new with a thirty-year-old franchise, but this premise doesn’t work at all. With memoryless protagonists, there’s not much recognizable here beyond names and faces, as the personalities of heroes and villains have been greatly altered or aren’t developed. The writing isn’t great, either. Adam goes through Skeletor’s minions Sinister Six-style, accomplishing little other than making the reader wonder why they insist on putting him through these James Bondesque scenarios instead of just killing him (not to mention why Skeletor didn’t just kill all the Heroic Warriors when he had the chance). The dialogue contains a painful amount of bickering between Adam and Teela, and the fact that Adam has no idea what’s going on, even though the reader does, prevents the buildup of any real suspense or interest. There are other story issues, too (e.g., how is Battle Cat still Battle Cat? And don’t tell me that’s a giant, feral Cringer), and there isn’t a great deal of payoff. This mini-series would have more appropriately been titled The Adventures of Amnesiac Adam, as He-Man doesn’t show up until the end of issue #5. And when he does, it’s something of a disappointment: this Yellow Cross He-Man – not much of a leader, not unduly clever, pouty, given to petty bickering – is the product of the unwise decision to put an immature Adam in He-Man’s body (Filmation Adam, in contrast, had a cleverness and maturity worthy of He-Man, and 200X Adam was getting there). This miniseries tries – too hard – for a gritty tone. There’s blood, killing, swearing, and the murder of an integral supporting character; none of these are inherently bad (except the last one, which is gratuitous), but none of it feels natural, nor does an angry, revenging He-Man. One last thing on the writing: the whole climactic “I am the power!” exposition is dramatic and all, but it’s also stupid and blasphemous. It stands in stark contradiction to every incarnation of Adam-as-He-Man we’ve ever had as well as to He-Man’s transformation invocation. The sword channeling the power from him makes no sense whatsoever. From him to where? It’s never gone from him anywhere except to Cringer. And if he is the power, why does he even need the sword? Ugh. On to the art. This six-issue series contains art from more illustrators than can be listed here. That never bodes well for the quality of the art, and it’s no different in this case. Many cosmetic changes have been made to costumes and characters, and none for the better. Scale mail is in, as is just enough fan service to be irritating. Teela is long-haired and blonde again for some reason. Castle Grayskull usually looks ridiculous. Skeletor looks like a steroid-fueled scarecrow, and his troops look like the Shredder. At least, unlike the 200X version, the Power Sword looks like it should. From little things like a new origin for Trapjaw to big things like everybody knowing Yellow Cross He-Man’s identity (which really takes the point out of Adam in any future stories), this mini-series boldly proclaims a new direction for the franchise. Now, I have no problem taking things in a new direction (as long as it’s not space), but if you can’t be true to the spirit of the source material or to the characters, then what are we doing here? Go write some Conan stories. 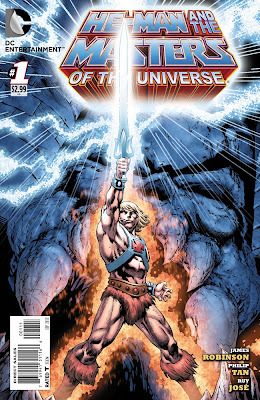 DC gives us the first real He-Man comics in nearly a decade, and it’s a profoundly disappointing experience: everything is so different and so badly done that it’s hard to take seriously. The new monthly ongoing is going to have to do substantially better than this if it’s going to stick.